Singapore’s female ice hockey players know that they are fighting an uphill battle. However, that knowledge seems to be fuelling their passion for the sport they love. “I’ve never felt more hope in my entire life than this previous year,” said forward Kiarra Chin. At first glance, there doesn’t seem to be much reason for her hope. The country has just 51 registered female hockey players, and female goaltenders are few and far between; there are only two in the country with Singaporean citizenship. Singapore has two rinks, but only one is used for ice hockey, and the female program competes with a number of other user groups for ice time, usually resulting in them practicing late into the night. 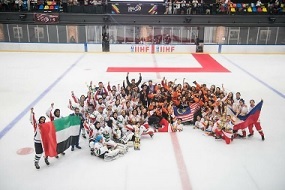 Last season, the country allowed 36 goals against and scored just five goals through three games in the top division of the 2018 IIHF Women’s Challenge Cup of Asia (CCOA). Singapore’s players long to perform well on the international stage, but know that they are facing tough competition as well as a number of obstacles that hinder them from improving. “We do know the people, the countries around us, and how ice hockey is actually developing very well in those countries,” said player and program director Valerie Cheng. However, Singapore’s women’s team has an enthusiastic spirit which allows them to simply enjoy hockey for what it is despite the many challenges they face. 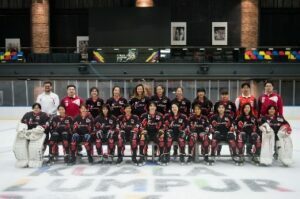 The current era of female hockey in Singapore was kickstarted in 2012, when the JCube rink was opened after four years of there being no ice hockey rink in Singapore (Fuji Ice, the country’s former main hockey rink, was closed in 2008). Many of the program’s current players, such as captain Emily Kwek and goaltender Caroline Ang, have inline hockey experience and picked up ice hockey in the years following the opening of the JCube rink. 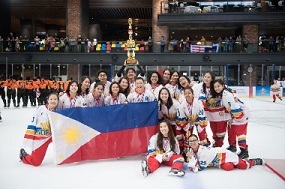 Kwek, Ang and Cheng were all part of the team that took part in the country’s first ever IIHF women’s event, the 2014 CCOA. They finished third out of four teams. However, that first tournament gave Singapore a taste of what their program could achieve. The CCOA quickly became the marquee event for women’s hockey in Singapore. “The whole experience kind of feels like this is the lifestyle, you can kind of experience it like a hockey player,” said Ang. While Singapore did not take part in the 2015 CCOA, by the time they returned the following year, the field of teams had grown. They finished third out of five teams in 2016 and third out of seven teams in 2017. For the 2018 CCOA, Singapore was placed in the top of two divisions along with New Zealand, Thailand and Taipei, and finished last. However, the attitude of Singapore’s players after losing 14-3, 10-1 and 12-1 is an example of their tenacious and forward-looking character. “When it ended, I just kept thinking that I can’t wait for more,” said Tiffany Yeoh, who made her debut with the women’s team at the 2018 event. Singapore will be competing in the top division again at the 2019 CCOA, and the players are looking forward to seeing how they have improved. The team is specifically hoping to increase their number of shots on goal and have closer games against the other teams. Over the last year, ice times have been progressively improving, and Cheng has collaborated closely with the JCube rink to run learn to play hockey sessions. There is even talk about trying to see if Singapore could have a second rink that could be used for hockey. Regardless of whether or not Singapore can compete with the top teams, the country has a group of players who are passionate about playing the sport and sharing it with others, which is arguably more important than winning a gold medal. Abbey Heale, at just 17 years old, has already played for New Zealand’s senior women’s ice hockey team (the Ice Fernz) at two IIHF World Championships. Also on her resume is the IIHF Women’s Challenge Cup of Asia (CCOA), which she competed in in 2017, and will be competing in for a second time in 2019. Heale represents the first group of young female hockey players from New Zealand to fully experience the country’s U18 Women’s Development Program, which is aimed at building a feeder system for the senior team and preparing young athletes to compete at a higher level, such as with the Ice Fernz. While the IIHF has a U18 Women’s World Championship program, New Zealand has yet to have enough players in order to join it, hence the creation of the current ideation of the U18 Women’s Development Program. While this program doesn’t lead to a World Championship, it has become largely built around the CCOA. When the U18 Women’s Development Program was first loosely created in 2013, it was centered around an exhibition series against Australia’s U18 team. In 2015, that shifted to an exhibition series against a team from the Toronto Leaside Girls Hockey Association. While the girls in the program got an opportunity to play against teams from other countries, the program’s leaders recognized that they needed an opportunity for their players to compete internationally on a larger scale. “The New Zealand U18 women’s team was looking for a competition arena, and the CCOA seemed to be a good fit,” said team manager Philippa Kaisser, who also mentioned that the program’s leaders initially had to overcome resistance to the idea of needing an opportunity for the U18 team to compete internationally. Today, the CCOA is the highlight of the U18 Women’s Development Program, and this season will mark New Zealand’s third appearance in the event. Their first appearance was in the 2017 CCOA, which they won. They came second in the Top Division of the 2018 CCOA. “The CCOA is a great tournament for our team as it is run along similar lines to a World Championship and thus gives the girls experience of an international competition that they wouldn’t otherwise get until competing on the senior women’s team,” said Kaisser. While Heale played in her first IIHF World Championship with the Ice Fernz just days before competing with the U18 team in the 2017 CCOA, the goal is that players will instead first get accustomed to the international stage at the CCOA. Players such as Hannah Cross, Rina Watt and Harriet Fuller will be making their first international appearance with the Ice Fernz this season after a few years in the U18 Women’s Development Program. This season, there are many players who made the U18 Women’s Development Program for the first time, with just seven players returning from last season’s team. The roster includes goaltender Lilly Forbes, who had an impressive 93.59 SV% and 1.97 GAA through three games at the 2018 CCOA. While prominent goal scorer Beth Scott is not on the roster this season due to spending time in Canada, Heale is returning after a year away from the team, and is expected to be a significant source of offence for them. She was a successful goal scorer at the 2017 CCOA and has proven her goal scoring capabilities in the New Zealand Women’s Ice Hockey League (NZWIHL). While the CCOA continues to serve as a great avenue for New Zealand to develop its young players, the goal is still to enter the IIHF’s U18 Women’s World Championship program. This year, head coach Angelique Mawson and assistant coach Michelle Cox had approximately 35 eligible players to select their team from, and they anticipate that next year that number will increase to 45. The inaugural Rivalry Series was created to give Canada and the United States another opportunity to put the world’s best female hockey teams on the ice together. 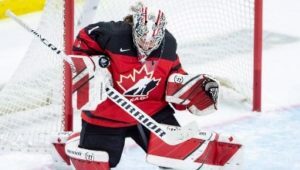 Brianne Jenner and Blayre Turnbull scored, Shannon Szabados made 38 saves, and the Canadians beat the Americans 2-0 in front of 9,048 fans Sunday in Detroit to win the three-game series. “We couldn’t be more thankful for the Red Wings and the NHL to help us out,” American forward Brianna Decker. Fans filled almost the entire lower bowl of Little Caesars Arena where scores of girls in hockey jerseys could be seen and heard. The Americans generated a lot of offence in the finale, especially during goal-mouth scrambles during a 21-shot second period and in the final minutes. Savannah Harmon had a goal for the Americans negated by a crease violation early in the third period when Trivigno made contact with Szabados.